7 USB 3.0 downstream ports for standard desktop PCs. Backwards compatible with USB 2.0 and 1.1 devices. With quick and easy installation, this USB 3.0 PCI express I/O Card offers a simple solution for connecting to USB 3.0 devices from your standard desktop PC. USB 3.0 is the latest generation of USB technology, boasting enhanced transfer rates of up to 5 Gbps. Transfer videos, music, photos, and data files between USB devices and your computer at blazing fast speeds. SuperSpeed USB 3.0: accelerated file access and transfer rates. Boost Your Peripheral Capability: USB 3.0 PCI express I/O Card with 7 ports. Connect and Go: Connect any USB 3.0 devices to your PC. Drivers for Windows XP, Vista, and Windows 7 (32/64-bit) are included in the provided CD. Drivers built in to Windows 8/10(no install required). This PCI-E card is powered by a LP 4-pin power connector or sata 15 pin power connector. 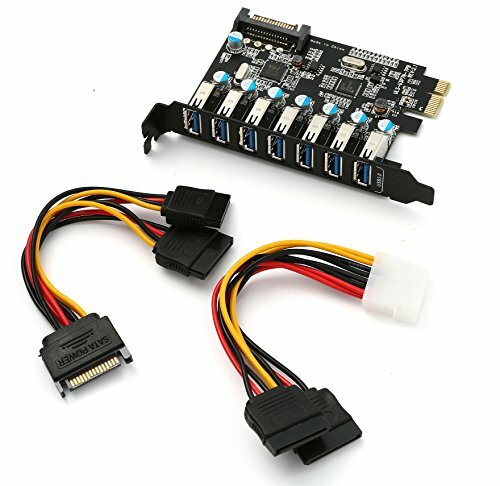 Please confirm that your computer motherboard is equipped with either a 4-pin power connector plug or sata 15 pin power connector before purchasing. This is necessary to ensure sufficient power supply and smooth transfers, particularly for large data transfers from hard drive disks (2TB or above). SuperSpeed USB 3.0: Supports transfer rates of up to 5 Gbps. If you have any questions about this product by TOTOVIN, contact us by completing and submitting the form below. If you are looking for a specif part number, please include it with your message.